home → Loans → Student Loans → Do You Qualify for Student Loan Forgiveness? Student loan debt forgiveness is only offered in two specific instances. The first is under bankruptcy, where there is a possibility to have a portion of debts discharged. This is the less desirable option, and it is not often easy to secure. The second main avenue to have federal student debts discharged is through public service. Many people think debt forgiveness for public service is easy to achieve, but the truth is there are very specific requirements. This option is intended to assist individuals who choose a career in a low-paying public service job. As such, borrowers who spend only one or two years in a service position will not qualify under the federal debt forgiveness program. Many borrowers will attempt to qualify if they enter an Americorps or Peace Corps program. These individuals will rarely qualify. Others who serve in the military will only qualify if they elect that job as a career. If a borrower has elected a career in public service, most careers will qualify. Typically any social-service job will meet federal requirements. The job must be low paying, however, in order to fully meet requirements. For a teacher, for example, it is necessary to serve in an under privileged district for a low salary in order to be eligible for federal debt forgiveness. Public defenders may even be eligible if their salaries are below a certain level, and they work with low-income clients. Once a borrower has qualified based on career choice, the borrower still has to meet minimum loan repayment requirements. A borrower should not expect to immediately have the entire sum forgiven. In fact, the borrower must make at least 120 months of payments. This totals to 6 years of repaying student debt. It is easiest to meet this requirement if a borrower has been making loan payments during the time he or she is at school. This is possible on most federal student debt that is unsubsidized. Starting payments early, even if those payments are very small, can produce a record of repayment. Interest-only payments still count toward the 120 month requirement. Once a borrower qualified based on career and has made 120 months of consecutive, on time payments, that borrower may seek student debt forgiveness. This will be for all federal student debts. Private debts are not subject to the same regulations. 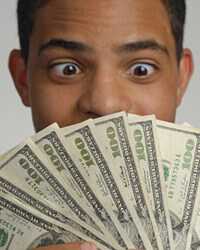 Borrowers may refinance to federal loans, however, and then seek forgiveness. The federal debt will be forgiven in whole, including all interest and principal debt. So, even if a borrower made interest only payments for 120 months, the entire principal sum could be forgiven. There are other very narrow programs that allow for federal student loan forgiveness. Certain government agencies may offer to forgive student loans as a way to recruit and retain employees. It is also worth knowing that federal debt not repaid in 25 years is forgiven, but a borrower may be taxed on this sum.